Noodle Tossing. Photo by Rick Halpern. Bong, bong, bong! The noodle chef smashed the dough onto the board. Man, it was loud! I had come to Magic Noodle, a restaurant at the intersection of McNicoll and Midland in Scarborough, to try the house specialty, Lanzhou Beef Noodle, an extremely popular dish in China. However, when I dipped my chopsticks into the bowl and took the first bite, all my complaints about the noise went away, for the hand-pulled noodle was indeed amazing. The broth had a lasting flavour, while the noodle was tender yet stretchy at the same time, like nothing that I had eaten before. As I left Magic Noodle, I became curious about where the noodles had come from. What is it about Lanzhou, the capital of the northwestern Chinese province of Gansu? Do the people there cook and eat noodles differently than elsewhere? Could a single individual have invented such a dish? The first known recipe for Lanzhou beef noodles was discovered recently in the peculiar form of a poem by the late-eighteenth-century scholar Chen Weijing. Few written recipes survive from the Qing Dynasty because chefs were considered a lower-end profession that seldom attracted literate people. Found in Chen’s old home by his ninth-generation descendant, Chen Jiuru, the poem listed two ingredients per line, although without further instructions such as the amount of each ingredient to be used or the cooking time forthe broth and noodles. Another historical problem is that Chen actually lived some 1,200 kilometers east of Lanzhou in the city of Suzhai. The next person to attempt to codify Lanzhou beef noodles was a chef named Ma Zilu, who lived in the early twentieth century. 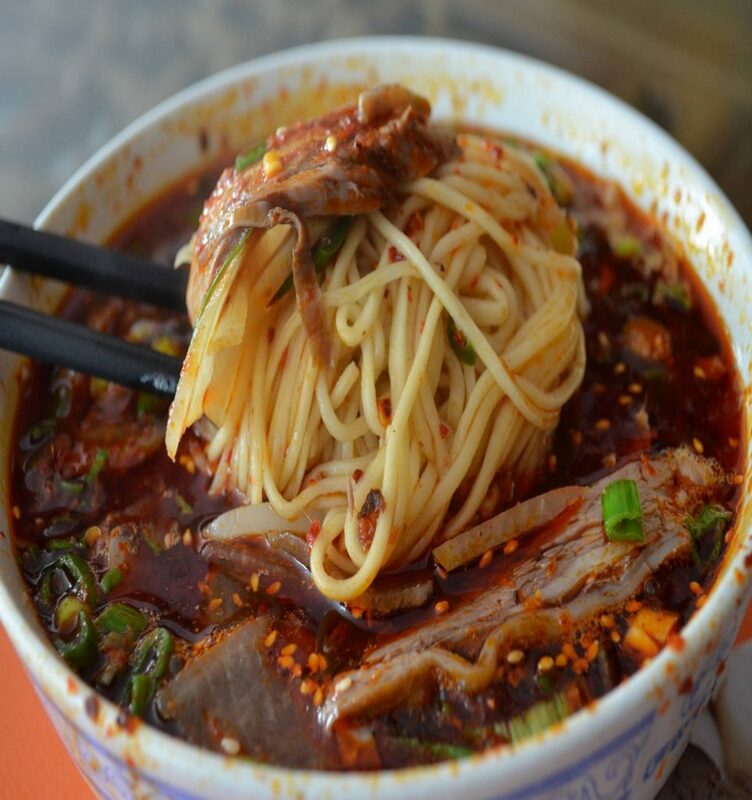 By that time, hundreds of beef noodle restaurants had opened for business in the city of Lanzhou, and the taste in each location differed dramatically from the others. Ma decreed that an authentic dish must include “one clear (soup), two white (radish), three red (chili oil), four green (parsley) and five yellow (noodle).” Working at a time when Chinese intellectuals were increasingly interested in western modernity, he also specified nine acceptable dimensions for the noodles, ranging from 0.5 mm all the way up to 5.5 cm. Having imposed a form of unity amongst the different restaurants in Lanzhou, Ma later opened a small food cart and traveled around China, introducing the signature dish all the way to the southeast port city of Guangzhou. Despite Ma’s wide travels, the spread of Lanzhou beef noodles was delayed by the upheavals of the Japanese occupation in World War II and the Communist Revolution of Mao Zedong. 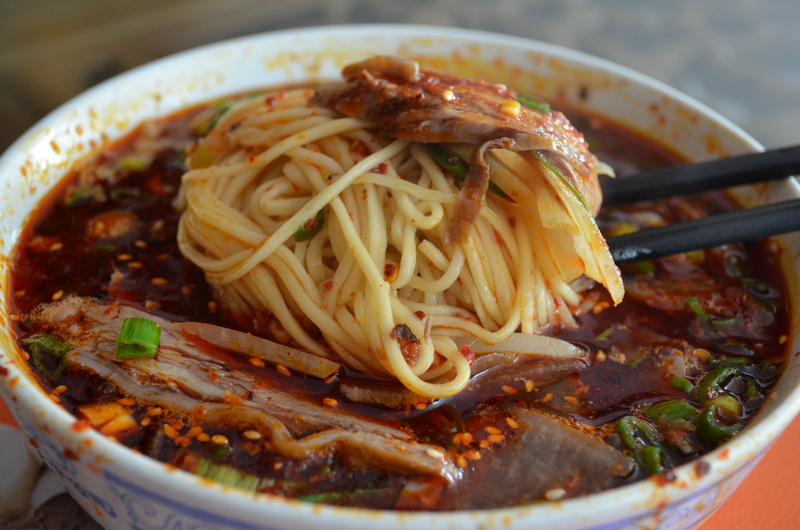 Only with the market reforms of the 1980s did “Lanzhou beef noodle” restaurants emerge in large numbers across China, and this phenomenon had nothing to do with Lanzhou. The establishment of “Lanzhou beef noodle” restaurants throughout China depended instead on entrepreneurial former farmers from Hualong, an impoverished county located 260 kilometers west of the provincial capital. 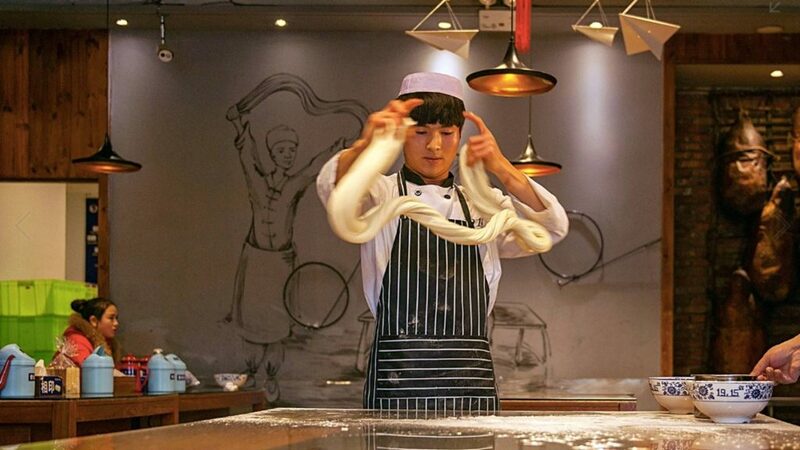 Unable to make a living on the land, they migrated to the nearest big city, Lanzhou, and took apprenticeships at noodle restaurants, where they mastered the art of hand-pulling noodles. Studying for as much as five years, they learned to twist and stretch the dough in a circular motion to align the threads of gluten and ensure continuous strings without beginning or end. If shaped and pounded correctly for ten to twenty minutes, the dough will have set into individual strands, which unfold when the chef cuts the ends of the circle. Because the strands are so long, a single noodle will fill an entire bowl, which symbolizes a long lifespan in Chinese culture, making noodles a popular choice for breakfast on birthdays. In the four decades since the Communist Party began its market reforms, residents of Hualong have opened some 12,840 “Lanzhou” beef noodle restaurants across China, which is nearly as many establishments as McDonald’s has in the United States. Noodle making proved more lucrative that Hualong’s former export industry (manufacturing illegal guns for the black market), and income levels in the county rose from an average of 344.4 yuan per month in the 1980s to a whopping 6,600 yuan per month by 2014. One may wonder how “Lanzhou beef noodle” arrived in Toronto. Although many restaurants offer the dish on their menu (see map 1), this seems to have been a recent phenomenon from the 2010s, with Magic Noodle leading the way. Since most of those noodle chefs came from Hualong and were trained in Lanzhou restaurants, they should be able to make the same noodle. Sadly, as restaurants experienced explosive growth, the original shop owners had little time to cook the noodles themselves, and quickly they taught new chefs the skills that needed at least five years to fully master. Therefore the overall taste of those restaurants drifted away from the standards of the Lanzhou beef noodle. One clear way to distinguish authentic Lanzhou beef noodle from those that simply use the name is that if there is “ramen” in the restaurant title, then it is likely one of the “fake noodles.” Although the term ramen is the Japanese pronunciation of the Chinese word “lamian,” meaning stretched noodles, in Lanzhou, the locals never refer to their noodle as “lamian,” and instead call it simply “beef noodle.” Apart from this rule of thumb, there is no clear way to tell whether a Toronto restaurant serves authentic Lanzhou beef noodle. since the owner or chef would likely claim they are from Lanzhou to present their restaurant with a sense of authoritativeness. But whether authentic or not, the craze for Lanzhou noodles has provided employment for many Chinese immigrants and delicious food for all Torontonians who seek out the dish. Ma Hongli, “Lanzhou Niu Rou Mian Chuang Shi Ren Hou Ren: 200 Duo Nian Zu Chuan Mi Fang Shi Shou Shi兰州牛肉面创始人后人：200年祖传秘方是首诗 [The Descendent of the Ancestor of Lanzhou Beef Noodle: The 200-Year Old Recipe Was a Poem],” Henan Business Daily, September 19, 2014. Zeng Huafeng, “Ma Zilu Lamian: Rang Ren Hui Wei 马子禄拉面：让人回味 [Ma Zilu Hand-Stretched Noodle: Making One Think Back],” The Renmin Daily, August 28, 2006. Corine Tiah, A Bowl of Lanzhou Beef Noodle. Beijing: CCTV News, 2015. Zhang Zhifeng, “Yi Wan La Mian La Huo Yi Ge Pin Qun Xian 一碗拉面拉活一个贫困县 [One Bowl of Noodle Took an Impoverished County Out of Poverty],” The Renmin Daily, June 12, 2015. Liu Su, “Liao Liao Lanzhou Niu Rou Mian He Ta De Tang Liao 聊聊兰州牛肉面和它的汤料 [Let’s Talk about Lanzhou Beef Noodle and its Broth],” 15yan.com. Accessed September 25, 2017. Available at https://www.15yan.com/story/546qMk0PO5K/.